Some silent horror films, the truly great ones, manage to retain much of their ability to inflict terror or even the “creeps” upon those who watch it. Silent films like Nosferatu, the Cabinet of Dr. Calgari and the Phantom of the Opera are a few of the titles with such a timeless quality. Though watered-down when compared to later versions, the story still stands strong, but what really stands out over so many decades are the magnificent set design and gruesome make-up effects provided by Lon Chaney Sr.
Christine Daae’ is a beautiful up-and-coming prima donna in need of her big break. The management of the Paris Opera House begin to receive threatening letters from a spectral being calling itself “the Phantom”. The Phantom demands Christine be given the lead in the showings of Faust, otherwise terrible calamities will begin to fall upon the patrons of the Opera House. Within her dressing room, Christine hears a disembodied voice tell her of his deeds as well as his love for her, and she is swept off her feet, much to the chagrin of her heroic lover, Raoul. At first the management complies with the Phantom’s demands, but under pressue of the mother of Carlotta, another up-and-coming prima donna, Christine is kept from the lead in Faust for a single showing. During that showing, the Phantom cuts loose the great chandelier above the audience, injuring many of the spectators below. While Christine is taken away by the Phantom to his lair deep beneath the cellars of the Opera House, Raoul does some investigating and learns the Phantom’s terrible secret. While the story is timeless, what attracts me most to the original Phantom of the Opera is the visuals. The film is very unnerving, particularly through the set design. The lanyrinthian catacombs worming their way beneath the Opera House are fantastic in their surreal, maze-like quality. Trap doors, underground rivers and sprawling tunnels really stimulate the imagination and make the chase sequence where Raoul and the Inspector hunt down the Phantom’s hidden lair all the more exciting. Honestly, the sets for this movie are equal in quality (but not quite in strangeness) to the ones seen in the Cabinet of Dr. Calgari. Of course, there’s the big reveal which we’ve all seen a million times in a dozen different interpretations: when Christine’s curiosity gets the best of her and she unmasks the Phantom as he plays the organ. Though the shock of the scene has been severely blunted do to pop culture, the quality of the Lon Chaney’s make-up holds up magnificently after 80 years. The face, as it was described before the unmasking, was that of a skull’s. Indeed, Chaney’s visage truly does bear a striking and frightening resemblance to that of a skull, with sunken eyes, a missing nose and sharp teeth constantly gnashing at the audience. 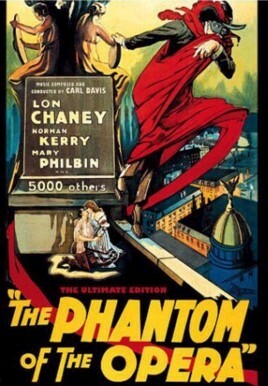 The Phantom is one of the better cinematic villains from his era, with the mystery behind the creature gradually unfolding and keeping the audience properly hooked. When he first appears he is nothing but a shadow lurking within unseen corridors, next he is a frightening man in an eerie featurless mask, then finally, he is shown as the monster he really is. A subsequent version of the film re-editted in 1929 added color to the Bal Masque sequence, and though some detest the colorization of classic films, I find it truly enhances one of the best moments in the entire film. The Phantom’s costume of the Red Death is made a great deal more sinister in appearance with the addition of blood-red crimson. The scene where he lurks on the statue above Christine and Raoul, spying on the two lovers with his red cape flailing in the wind remains one of the most visually impressive moments in the film and quite honestly my favorite part of the movie. The original Phantom of the Opera is my favorite version of the story, produced long before Andrew Lloyd Webber would add crazy techno music to the thing. It’s a silent classic which remains just as entertaining today as it was 80 years ago. I can’t possibly give this film anything less than an A.